It will be tough to find a modern restaurant or coffee shop that does not use banner displays in one form or another. Their ability to make any outlet look more attractive and professional is well known. Most restaurant and café owners have realised that their potential goes much beyond just looks and ambience. They are very effective sales tools and can be used to attract customers, improve sales, and advertise new items. They are also useful in organizing the outlet and increasing customer comfort. Read on and discover some exciting ideas with coffee shop banners. 1: Attracting customers on the street and encouraging them to walk in. 2: Window displays and wall decor. 3: Organizing the outlet and seating areas with partitions. This is especially useful in outdoor seating areas. 4: Providing information inside the outlet, for example, the menu, store timings, new items or special offers. Banners can make your outlet visible to customers even from some distance on the street. Fairly large signs are visible even from a block away when placed at a height. Your logo or message on the Ex-Disc circular banner that moves with the wind will attract attention from a distance. Being a display that is designed for outdoor use, it will not be affected by the elements. A strategically placed display stand on the pavement that displays your best selling menu items or specials will encourage passers-by to walk in and try something. The vertical A-Frame pop up banner is a good option for this purpose. It can be weighted down for stability and its two banners will allow you to display colourful graphics or messages to attract people coming from either direction. A picture is worth a thousand words. Posters in shop windows and walls are great methods for advertising specials, providing information and displaying large pictures of menu items. The best option for this kind of display is the fabric poster. Fabric posters can provide much better quality and durability than other options like PVC, card or paper. Posters printed using dye sublimation technique are much better in looks and quality than the ones printed by screen printing. Fabric posters come with many mounting options. They can be hung from the ceiling, wall-mounted or made to stand on the floor. They help you utilise space much better and if done properly will maximise the number of customers that can be accommodated at a time. For the customers seated outside, they give some amount of protection from wind, noise and dust from the street. You can also use them to separate smoking and non-smoking areas. They give you a large display area to further promote your brand, for example, to announce the opening of new outlets, show new additions to the menu and advertise combo offers. Combination fabric backdrops made from polyester can be used as barriers that will give the required protection from the elements. As stability is more important than portability in this case, a solid base plate is the best option. 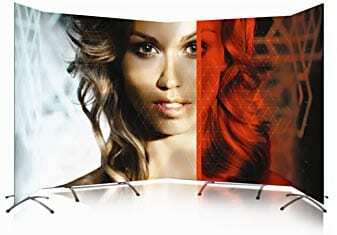 You can use them to display graphics on both sides or keep it plain and simple in the colour that you prefer. They are also easy to set up and you can change your seating arrangement quickly when required. 4: Displaying specials and offers. Cross base stand with telescopic pole and a set of graphics: This is easy to set up and the graphics can be changed in an instant. You can also adjust the height for different type of banners. They are also lightweight and portable. You can easily move them around or pack them up when they are not in use. Use them around the seating area, next to the cash counter or as a sign just inside the entrance. 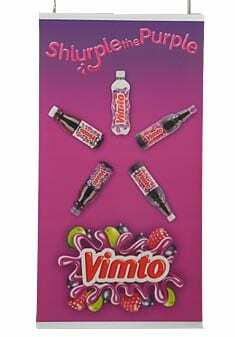 Tabletop banners: Use them on the counters to display the popular menu, specials, offers or signs. They are lightweight, take less than a minute to assemble and can be easily packed up when not in use. With banners, the possibilities are limited only by your imagination. We are sure that there are many other applications that you can think of depending on the type of outlet that you run. We have only discussed some basic applications and ideas that are commonly used. Irrespective of how you use it, always make sure that the coffee shop banners you buy are portable, sturdy, durable, reusable and provide excellent graphics with true to life details and colours. While cost is always an important factor, the best products are environment-friendly and come with excellent after sales service and support. They may not be the cheapest in the market, but are certainly cheaper in the long run. 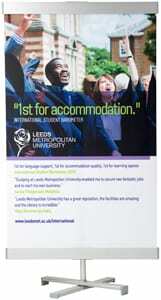 Learn more about FLEX display display banners and what we can offer your business or contact us via the form below now, we’re here to help.